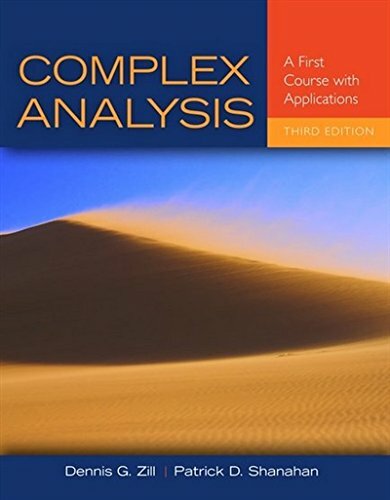 1449694616 -Complex Analysis: A First Course with Applications is a truly accessible introduction to the fundamental principles and applications of complex analysis. Designed for the undergraduate student with a calculus background but no prior experience with complex analysis, this text discusses the theory of the most relevant mathematical topics in a student-friendly manner. With a clear and straightforward writing style, concepts are introduced through numerous examples, illustrations, and applications. Each section of the text contains an extensive exercise set containing a range of computational, conceptual, and geometric problems. In the text and exercises, students are guided and supported through numerous proofs providing them with a higher level of mathematical insight and maturity. Each chapter contains a separate section devoted exclusively to the applications of complex analysis to science and engineering, providing students with the opportunity to develop a practical and clear understanding of complex analysis. The Mathematica syntax from the second edition has been updated to coincide with version 8 of the software.